Franchising had been something that soon-to-be business owner, Deyong "Roy" Wen had been thinking pursuing for some time. He'd been toying with the idea of starting his own restaurant location, he said, and had been spending time gathering information on different brands. As well as ways to get started, such as real estate options, and more. In fact, he was in talks with a worldwide (and household known) brand to open up his shop within the year. That is, until he ate at Dickey's Barbeque Pit for the first time. A native of China, Wen said he'd never eaten at a Dickey's restaurant, let alone thought about opening one of his own. He ordered, enjoyed his meal, and began thinking about opening his own BBQ franchise. "I thought, 'This food is great. There's something different about it,'" he said. In comparison with other fast food brands, Wen said Dickey's impressed him with meals that are tasty, fresh, and recognizable. "It's actually beef – with other brands you can't tell what their food is made of." Instantly impressed, he got online and reached out to the brand about opening up a potential location. They contacted him and with both parties' approval, the whole process began. However, it wasn't just the food that first drew Wen in. Barbeque, he said, sounded like a great venture, and one with longevity. "It's the type of food, that everyone will like sometime in the year," he said. Adding that the brand seemed like one that would provide him with repeat business throughout the year. "Personally, I thought it would be a good food category." Next, Wen looked into Dickey's history, and soon found that he appreciated their long-running past. "Dickey's is a strong brand. They have a longer history than other brands," he said. Wen's contact through Dickey's, Chris Jones, director of franchise development, began working with him on a Southern California location, which will be one of more than 100 locations in the state. With even more to come, Jones said. Though the two parties have been in touch for a year – with Wen looking to open for business in November. Jones added that he and Wen talked initially before signing any paperwork – a standard procedure that helps both sides ensure they are making an ideal business decision. Additionally, Wen returned to China for six months and continued to talk with Dickeys representatives while he was gone, he said. The duo then put their plan into full swing once Wen returned to the states. "They're very honest and easy to work with. Everything's going very smoothly." Wen said he's working "day and night" to get his restaurant up and running. He's so excited about the venture, that he's also talking with friends about how great his Dickey's experience has been, encouraging them to franchise, too. "But only good friends," he laughed. "I don't want to give away my secret. It's too good." The brand has been in operation since 1947 and franchising since 1994. They've opened more than 565 locations in the United States, Jones says. Dickey's brand has been tagged as the "fastest-growing restaurant chain in the country" since 2012 and listed on QSR Magazine's list of Best Franchise Deals. They consider themselves in the genre of "fast casual food." 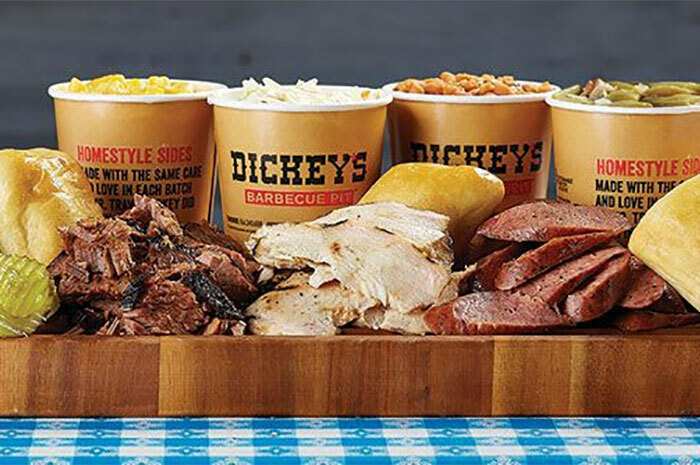 Some of Dickey's best sellers include brisket, ribs, spicy cheddar sausage, and their famous sides such as fried okra and jalapeno beans. They still use their original recipes coined when their first restaurant opened in Dallas, Texas.